An ID3 tag is a metadata container that is most often used to store information about an MP3 file. The relevant information about an audio file like the name of the artist, album, track number, track title and genre is embedded within the audio file itself in ID3 format. The information stored in the ID3 tags of the audio files can be changed, edited or otherwise removed completely altogether. To do so, you can download and use any tag editing software which is also known as tagger. A tagger is an application that is used to edit the metadata (in ID3 format) of the audio files. The primary purpose of tag editors is to scrutinize and sort the information that is embedded within the multimedia files. There are many taggers available on the Internet in both free and paid versions that can be downloaded and used to organize your music library efficiently. Here we list the top free ID3 tag editors that can be downloaded from the Internet for free. The free ID3 tag editors is a free software that can be used for both personal and commercial purposes. The free ID3 tag editors supports both of the ID3 versions: ID3V1 and ID3V2. 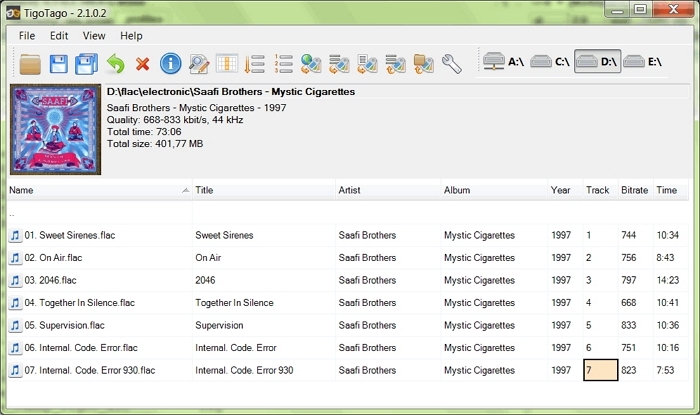 Using the ID3 tag editor software, you can edit the metadata that is embedded in the audio file in the ID3 format. The program allows you to jump easily to the specific locations of the embedded information within the audio file, thus enabling you to edit and rename the ID3 tags efficiently and with ease. •	Allows you to add your own comments to the audio files. •	Provides a synchronized slide show of the images and titles during the audio playback. •	Supports embedded cover picturse. •	Supports latest ID3 versions. •	Supports both Windows Vista 32-bit and 64-bit editions. •	Processor: 500 MHz processor. The faster the better. •	It's a free software with no ads or spywares inside. •	It's a user-friendly application as it allows you to rename the tags in a smooth and simple way. •	Enables you to view the information in the form of a synchronized slide show during playback. •	Does not support multi-file editing (batch editing). 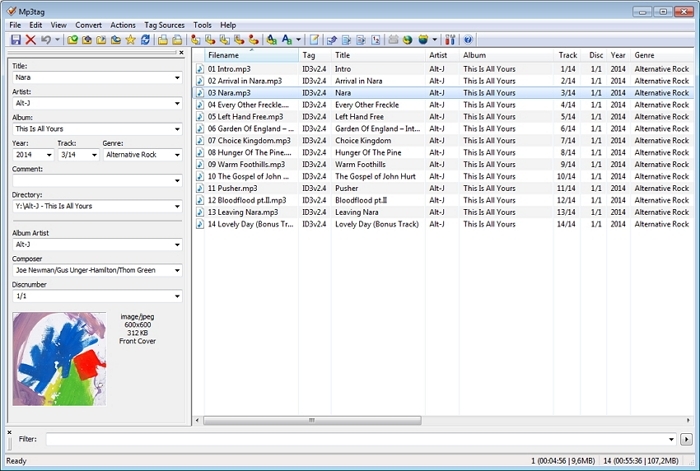 ID3-TagIT is a free ID3 tag editor which is used to rename and edit the metadata of the ID3 tags in the MP3 files too. This free ID3 tag editors scrutinizes and sorts the information that is embedded in the ID3 format. What makes ID3-TagIT different and superior from other taggers is that using this software, you can even edit the ID3 tags on multiple files (process known as batch editing), and can easily organize the files in folders. Supported Operating Systems: The software is specifically designed for Windows platform. •	Supports both single file editing and batch editing. •	Supports both ID3V1 and ID3V2 versions. •	It has a simple user interface without any unnecessary toolbars. This makes editing the tags easier and faster. •	It's an intuitive and a user-friendly program. •	The software can handle several comments and genres in ID3V2 tags. •	Organizes the files into folders. One of the major drawbacks of ID3-TagIT is that further development of this software has been terminated, and therefore the latest versions of the program are not available. Download Link: http://download.cnet.com/Stamp-ID3-Tag-Editor/3000-2141_4-10580125.html(available in both free trial version and paid professional version). This free ID3 tag editor enables you to rename, edit and delete the metadata embedded within the audio files. Such metadata is mostly stored in ID3 format. The free MP3 ID3 tag editor enables you to edit the information like genre, title, artist, album, year, track number, comments of an audio file which can help you organize your music library efficiently. •	Enables you to edit the metadata information stored in .WAV, .MP3, and any other audio file format that supports ID3 tags. •	Supports multiple file editing (or batch editing). 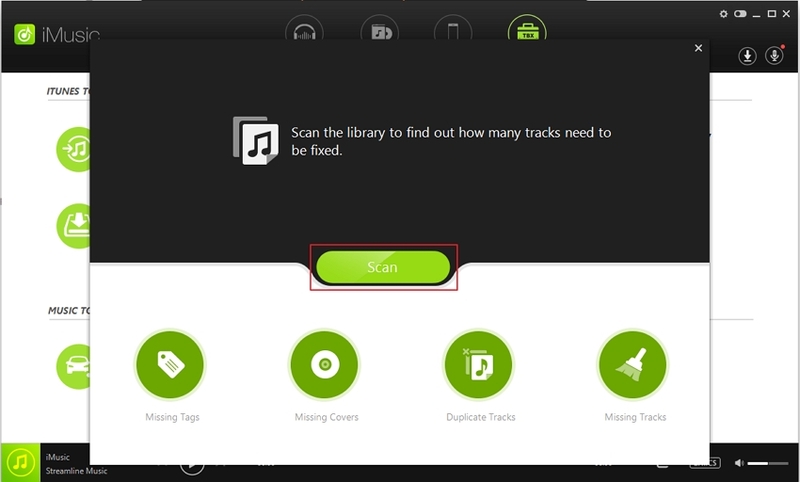 •	Enables you to listen to the audio files before editing its ID3 tags. •	Has limited support for editing the .WAV file metadata. •	Does not let you add spaces between the words. Tapping spacebar plays the selected song instead of adding a space. •	Has unnecessary substantial add-ons. •	Does not let you write your own genre or category and you are compelled to select one from the list of option genres present within the software itself. 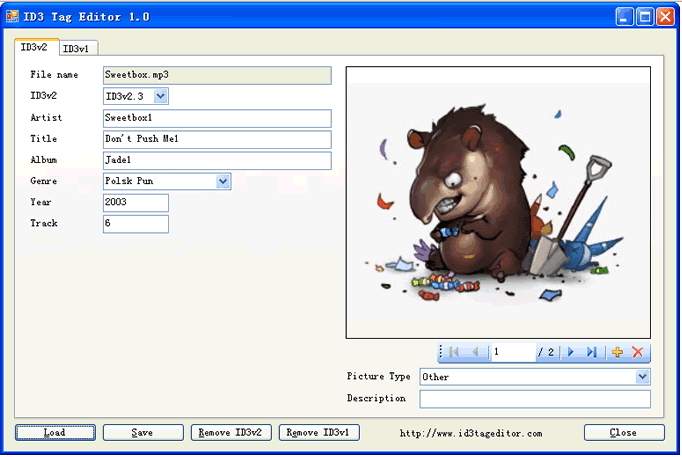 This free ID3 tag editor is a freeware application that comes with an easy-to-use windows interface. You can use the software to edit ID3 tags which include the title of the song, artist, album’s name, year of release, track number, and genre. The basic tags are displayed in customizable front panel, whereas the extended tags are shown in a separate window. This free mp3 ID3 tag editor supports online database lookups and enables you to embed multiple images for your album cover. •	Supports most of the common metadata formats including ID3V1, ID3V2.3, ID3V2.4, iTunes MP4, .WMA, and APE tags. •	Has an automatic rename feature that renames an audio file based on its tag information. 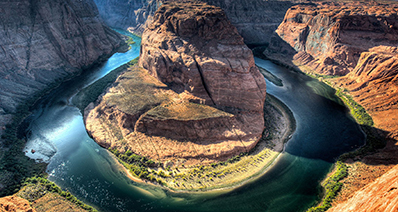 •	Supports editing cover images. •	Enables you to import tags from online databases. 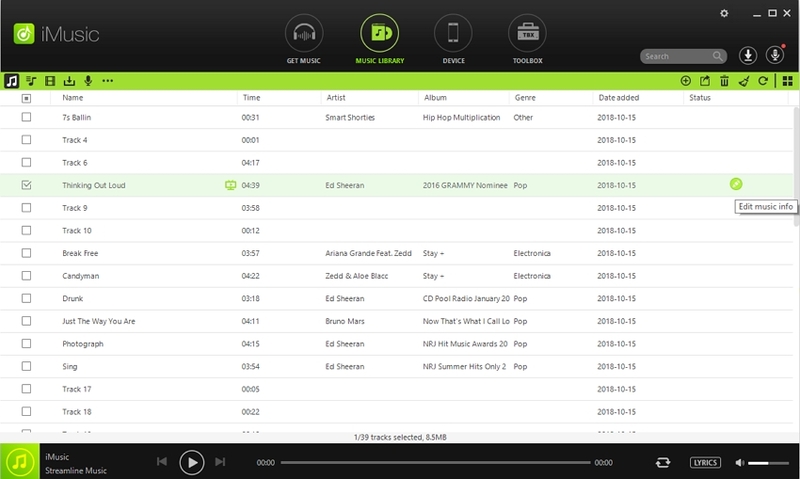 •	Creates playlists automatically while editing. •	Has no available portable version. 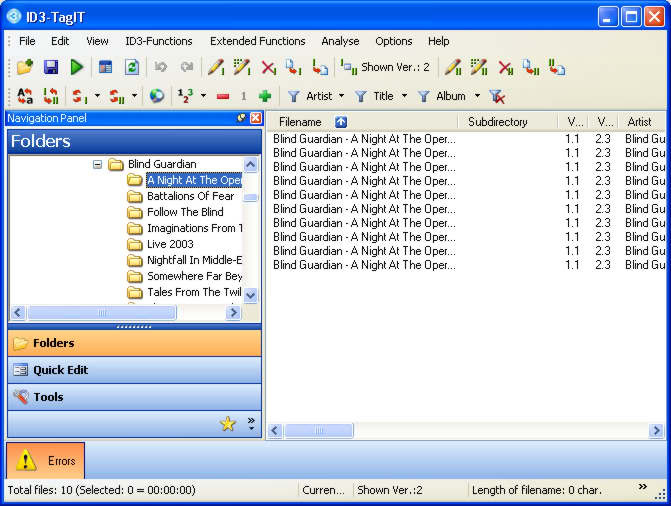 •	Provides the option of adding the lyrics column in the front panel, but it is restricted to 6 lines and inextensible. This free ID3 tag editor is a spreadsheet based tag editor that enables you to edit ID3 tags of multiple files efficiently. The Batch Editing feature enables you to easily modify tags and rename a large number of files in a single go. 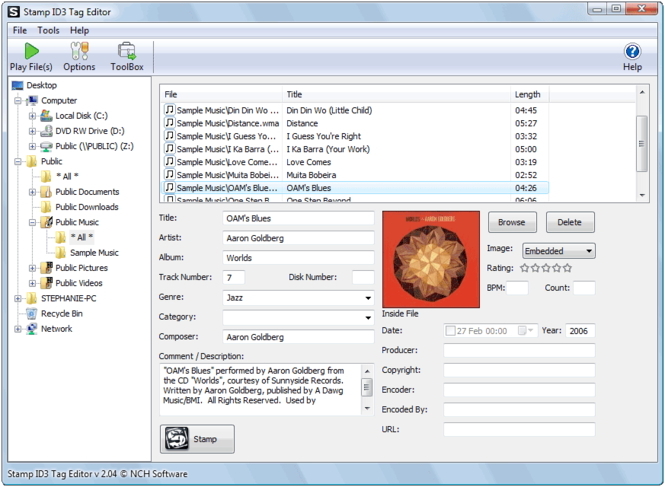 This free mp3 ID3 tag editor supports both basic and extended tags. Supported Operating System: Windows XP/Windows Vista/Windows 7/Windows 8. •	Supports online database lookups on freedb.org and discogs.com. •	Provides http connection with proxy authorization. •	Has a user friendly Help forum that provides descriptive answers with multiple screenshots. •	Allows you to preview all the changes before saving. •	Allows online database search from only two websites. •	Does not have traditional menus as other interfaces of Windows-based applications do. •	Does not have any portable version released till date.